It was constructed in 1967 by Norman Sheffield and his brother Barry and opened in 1968. Can be identified by "TRIDENT" in the runouts (please use Lacquer Cut At). Lacquer cuts for Phonodisc Ltd. (between March 1969 and January 1979) can be identified by //# T in the runouts (e.g. Clifford T. Ward - Home Thoughts From Abroad). Lacquer cuts for PRS Ltd. (between February 1979 and ~1982) can be identified by ▽E T (e.g. Genesis - Duchess). Lacquer cuts for PRS Ltd. (between ~1982 and mid 1988) can be identified by ▽420 V (e.g. Various - Batcave: Young Limbs And Numb Hymns). Masterings for Lyntone Recordings Ltd. (please use Mastered At) can be identified by ITD (or 2TD) (e.g. The Kinks - Waterloo Sunset / Dedicated Follower Of Fashion). In October 1981 Trident studios closed for 3 months due to financial problems and was then sold in December 1981. It was bought by its senior engineer, Steve Short, along with three other investors. During the following four years the studios worked under different management until 1985, when Tape One bought the studios and renamed them to Audio One. Also credited as "Trident, London, England", "Trident Studios, London" or "Trident Sound Studios". 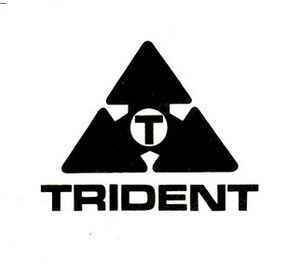 Side note: In 1986, Short bought out the other investors and opened Trident 2, a 25.000 sq. ft. converted theater as recording environment in the heart of the city of London. The current residing business Trident Sound Studios, which opened in the same building in 1993 was named in recognition of the original Trident Studios.